« Exhibition Centre needs £50 man to return + £50 woman too ! As regular followers will know the City Art Centre at the back of the Waverley Station has often cropped up as a possible home temporarily or otherwise for some time now. That interest seemed to have ended when they refused even a short pop-up despite being virtually empty. The Fruitmarket Gallery however did step in and we had a hugely successful exhibition in June with over 1,500 people visiting over the three days. Following that it was suggested I speak to Paul Lawrence the council’s Chief Executive for Place. Paul, a no nonsense northerner from Hull with a soft southern job title, was very supportive and interested not just in the centre but also on the current state of Edinburgh’s venues. I had previously spoken to Frank Little the museums and galleries manager who wasn’t keen on the idea but Paul said he would speak with him again and with news that Frank was now a convert we met up. 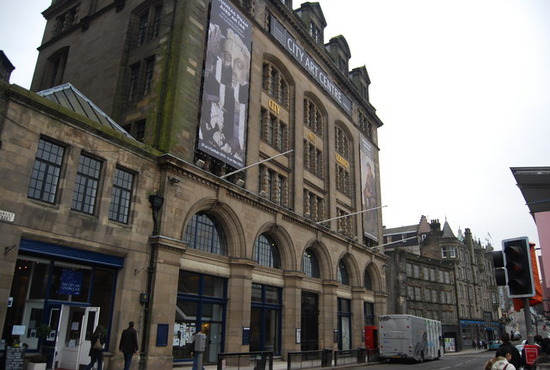 The day before I had met with Donald Wilson the Culture Convener who had pledged his support saying the exhibition centre was just what Edinburgh needed and just what the City Art Centre needed ! One suggestion from Frank was that I was given the top floor of the City Art Centre which though hired out was done so infrequently. With a small presence on the ground floor and a lift as you come in straight to the top floor it wasn’t perfect but a great space with great views. I gave Frank a proposal of what was intended so we could then discuss things further. When I say “give” me the top floor I would have been expected to make sure the CAC wasn’t out of pocket by offering a payment a little greater than their previous income. However I soon received an email saying the CAC was fully booked with exhibitions for the next three years and there was no space for me. This was very odd in that it made the meetings we had had pointless but more importantly the top floor is not an exhibition space, part of the reason it had been considered. Back to square one Paul Lawrence’s desire to help meant he agreed to meet just before New Year. Unable to come up with any other options Paul agreed to put the CAC top floor plan to Frank Little again. We agreed I would offer a little more than the average of the last three year’s income and I made an FOI request to find out what that offer should be. I had a second meeting with Councillor Wilson mid-January when he reiterated there was nothing more needed said to convince him of the worth of the project. Paul had flagged up the council would need to agree that there was no need to follow due process given this was a temporary project, possibly for a year, and the council would be financially better off than previous years. Councillor Wilson said he wasn’t even sure it needed to go to committee but would check and if it did it was a Culture not a Finance matter and agreed to liaise with Paul. Given the time constraints in trying to be ready in time to coincide with the National Museum’s exhibition I was concerned about how long all this would take and I then received an email from Paul Lawrence saying my best outcome would be to have it put before the Culture Committee on the 20th March. This was tight for being ready indeed but doable and gave me time to assemble a small team of helpers for a presentation. I would need to show quality within the exhibition and the Fruitmarket Gallery offered to give a recommendation. With the museum having also taken several of the exhibits from the pop-up the quality was not going to be an issue. Financially I spoke to potential sponsors who would look to cover the proposed rent of around £10K – £12K. I had offers of free food and drink for launches and free advertising both from established advertising companies and record shops all over the world. By coincidence an old customer and friend who now lives in LA and was a photographer in the 80s was over visiting and not only offered me many unseen band photos but also a professional trailer for the exhibition as his job in LA was to produce film trailers and adverts. I agreed with the council not to say anything publicly which of course would have helped with the fundraising but the response privately was tremendous. The Council would then determine a successful bidder based on a range of criteria. The first point alone baffled me. There was no change of use as it was a hire space that could be hired for just what I had planned. In fact if the exhibition was not to be treated as a trial, which it obviously was, then it could be treated as a lengthy hire which of course was also true. Neither involved due process something I had taken (free) professional advice on. I was asked if I still wanted to continue. Given that there was no guarantee of success, no idea of cost and it was impossible to reach agreement in time this was an offer designed to be unacceptable. My initial reaction was just to give up but then I realised that as I had been working to March 20th I should at least consider options until then now the plans could go public. What has caused this turnaround ? I genuinely don’t know. Donald Wilson and Paul Lawrence could not have been more helpful and generous with their time. Both hold very senior positions one as a councillor and one as a council official. It’s important to have both sides on board I’m told. Yes Minister is certainly good grounding for understanding the relationship. I’m not sure who else would have the authority to insist that due process was followed even when it was unnecessary and why they would do that. Apart from that there has been a feeling for some time that the CAC is to be sold. This was pure conjecture from staff and those close to the CAC on the basis that it was so badly run there had to be an ulterior motive. It has been acknowledged now by most involved with the CAC that there have been issues for some time in every department though they don’t thank people for pointing that out. The recent report that footfall and income were both down over 30% was blamed on being closed on their two quietest days which clearly was a flawed argument. Maybe there are plans, be it a sale or some other major overhaul, and they would rather I wasn’t in the way. Maybe the CAC understandably annoyed at being shown to be struggling instigated the decision to enforce due process. I have to say I was initially invited to look at using the CAC by staff and that it has so demonstrably been underutilised, as the council prefers to say, is not my doing. All of this is conjecture and possibly wide of the mark on every count. I’m still of course in touch with the National Museum and Waterstones are on board to support Scottish music. There are many exclusives I could source if I want to. Avalanche is a worldwide brand which never ceases to amaze me and I have an offer to consider at the beginning of March based on Avalanche but with interest in the centre too. I have interest from Glasgow for the centre which needs to be followed up but for now I will give things until the middle of March and if no home can be found by then I will need to reconsider. I’m already getting regular enquiries about when the centre might open with some people looking to book holidays and it is hard to believe such a popular idea would be blocked by the council after being so supportive originally. I have sunk every penny I have into this or we wouldn’t have reached the stage we have now. I simply can’t afford to do that any more and until the centre finds a home it will be impossible to bring on board sponsors and the other revenue streams needed. Apologies for not having something more positive. Believe me I never expected this outcome from the council after so much support. I suspect there may still be more twists in the tale. Still to come – Trinity Apse, the City Art Centre’s cafe and what I’d do given all of the CAC !